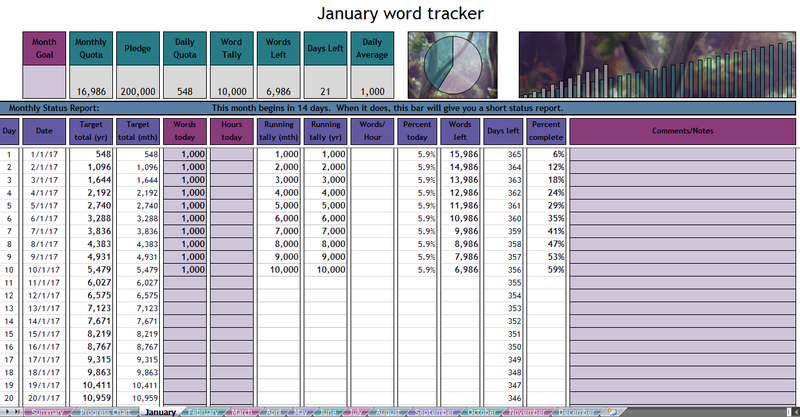 Word tracking spreadsheets for 2019! I make new ones every year and this page will be updated accordingly. Here’s some previews – download links are further down the page. If for some reason the image links don’t work, there’s a handy text list below them! Instructions are included. You’re welcome to edit and share these, but please don’t use the images for anything else. They’re all made with my own artwork. If you’re looking for a spreadsheet to track individual projects or shorter time frames, I now have a project tracker available as well! All the spreadsheets are available for free. If you want to give back, please check out my art shop or sharing the link to this page with others who might be interested, or donate directly via PayPal or Ko-Fi. Your support is what keeps this page going – thank you so much! I take requests for custom designs, but every hour I spend on these is an hour I should really be spending on my actual work, so I give preference to folks who donate. Either way, though, request away! Different theme for each month! I don’t own a Mac, so, no. I’m told by people with Macs that these work for them, but your mileage may vary. Your best bet is probably to re-download the file and start over. How do I get them for free? If you don’t want to pay, just put “0” in the price field and you won’t be asked for any payment info or anything. Can you make a tracker for a few months, or a specific month? I did! It’s here if you want to check it out. 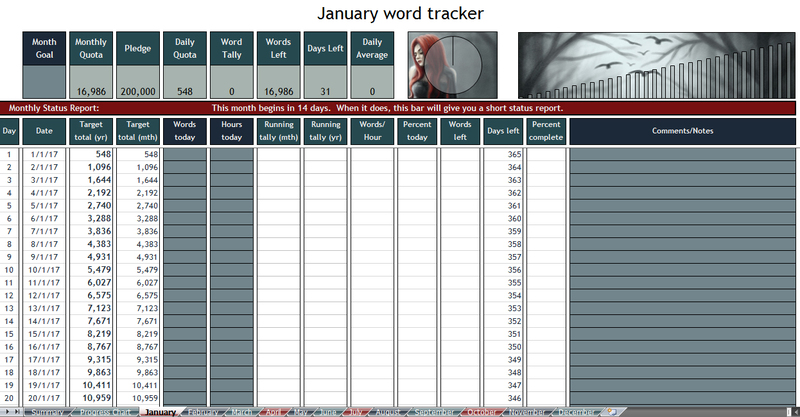 Alternatively, you can set the custom word count for all the months you DON’T want to track to 0, and you’re set. Will you make new ones for next year? If you’d like to help out with running costs of this site and enable me to keep making these, you can donate directly via PayPal or Ko-Fi, or pay whatever you like on Gumroad. Thanks a million for the support! Oh, wonderful! I’ve been waiting impatiently while hoping for a new Loki spreadsheet. You have no idea how helpful these are. If I had anything to spare right now, I’d donate to the cause! Thanks so much for making these. Thank you so much for these! They have just the level of detail I was looking for! Thank you, thank you, thank you SO much for these! 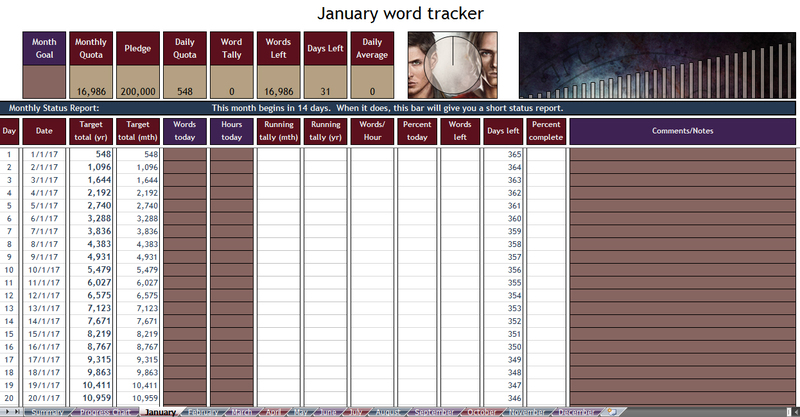 I used your tracker for 2015 and will do so again this year. I couldn’t live without them. Did I say thank you? Well, THANK YOU SO MUCH!! Yeah, that’s basically me with the new SW movie. :D I liked the new Trek movies but they are very different from the original, so I totally get it. I’ve been waiting for these! I heard about you via NaNo, and have wanted to do something exactly like this. This is so much more than I could have done, and Loki is…well, Loki :D. I made a small donation. I wish I could give more, but at this time it’s not possible. But I want to encourage you to keep on with this greatness. Next year I plan to do more. Happy New Year! I’m really glad you’re finding them useful. Thanks very much for the support as well – every little helps and I really appreciate it! Happy New Year to you too, and best of luck with your writing! Thank you so much for making these! I used one all through last year, and it was so tremendously helpful. It was the most consistent tool I used for managing my writing this year. Thank you so much for the work you did making them, and for putting them up for free. I just donated, though honestly that doesn’t quite seem like the right word since I’m really just paying for a wonderfully useful service that I got to use all year. If you ever have the time and interest to add to any of these designs, your Furiosa artwork is AMAZING, as is your Han/Leia and your Scarlet Witch. Any of them would be fantastic to look at during the entirety of my writing year. Many many thanks also from my side. I am using your spreadsheets every day and I just made a little donation. Please go on updating your spreadsheets in the years to come! All the best fur 2016! Thank you! I’ve been waiting for these. Great resource and much appreciated. Happy 2016! Thanks so much, Svenja! This is going to be so very useful! Sorry about that! The code messed up for some reason and kept lumping all the pictures/links in together. I thought I’d caught them all, but not that one, apparently! It should work now. :D I’m glad you like them though, thanks! These are amazing, and SO what I’ve needed! I’ll be using the SPN “Angels & Demons” one for my fanfic, and the Steampunk one for my original stuff. Thank you so much for creating these! You’re awesome! I just wanted to let you know that I absolutely love these. I discovered them last year, and I was thrilled to find more for me to use this year! I usually have one for each project I’m working on and then one for the overall year, and they’re so helpful, and motivating. Plus, they bring out the fangirl in me. :P Wonderful job!!!! Thank you so much for these. I love them! Hi, thank you for making these. 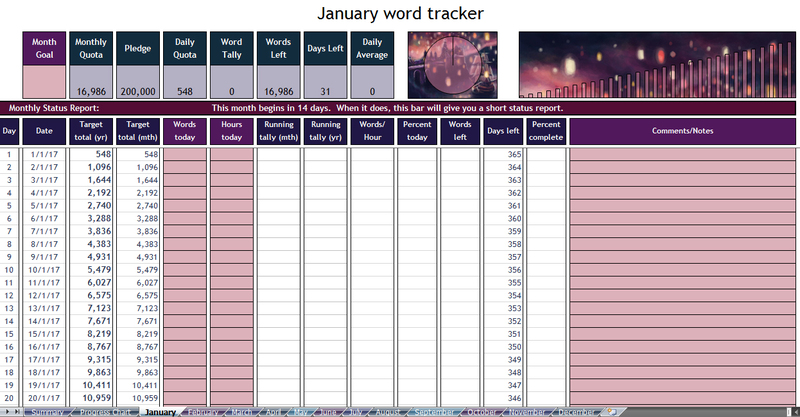 I used your NaNoWriMo tracker this year and I found it really helpful. Hopefully, this year tracker will be twice as helpful! Although, I think that choosing one might be close to impossible as they’re all so beautiful. I’ll hopefully be downloading one now though as my memory is so poor that I don’t want to forget! It doesn’t make much difference, but direct donations are generally slightly better for me! Thanks for the support!! When you plug in your goal at the very beginning.. is this the year-long goal or your daily goal? The year-long goal. It’ll calculate the daily quota from that. I use your tracker EVERY year, and I love it. I can’t wait to see the ones for 2018, and I will certainly make a small donation. 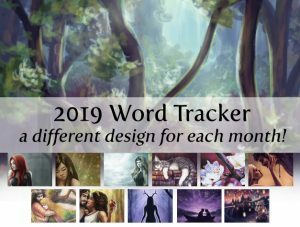 I’m looking forward to this year’s tracker! Thank you for doing this. Thank you! I tried to donate via Paypal, but it wouldn’t go through and I received a message that I should contact you regarding the payment. I hope you get things sorted with Paypal. I’ll try again soon. Yeah, I didn’t get any payment from you – I have been getting others, though, so I’m not sure what the problem with that is, to be honest. This link might work? paypal.me/SvenjaGosen Or you can pay via Gumroad as well when you download it. But either way, thanks very much! 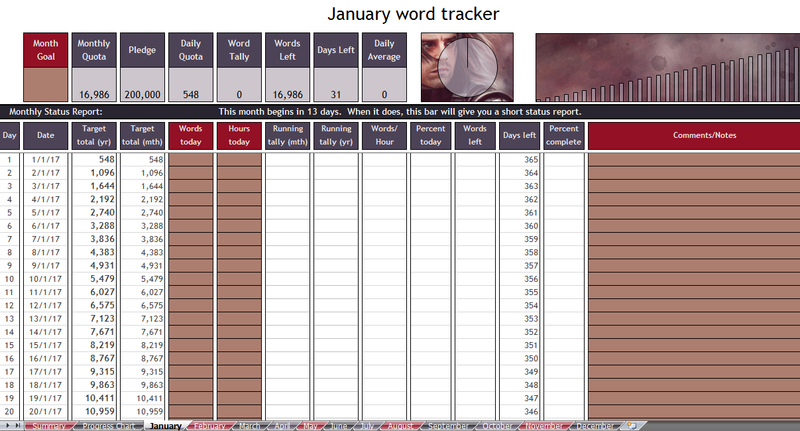 Hi Svenja – thanks so much again for your word tracker. 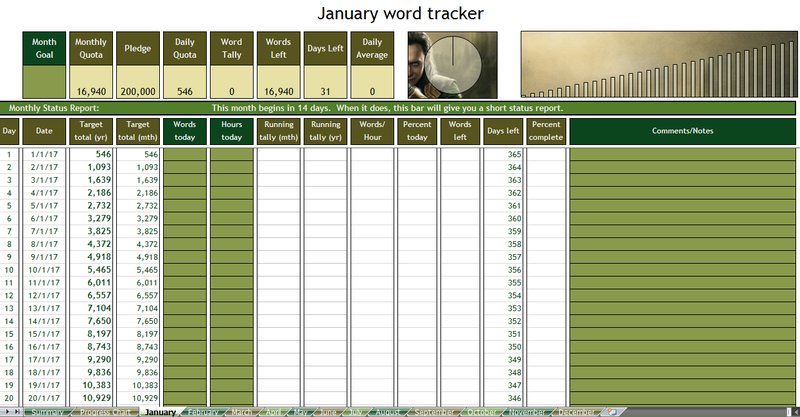 Is there a way to track words for a six-month target / goal (and have the tracker adjust all countdown features etc. the same as it does for a 12-month total)? No problem! Thank you! And, yes. 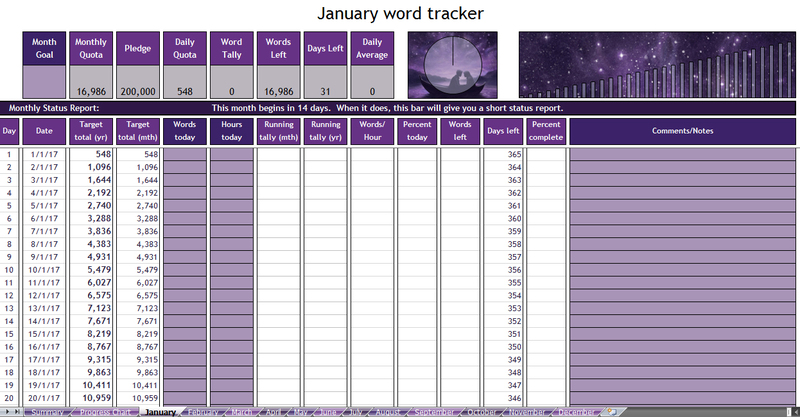 Set the custom word count for all the months you DON’T want to track to 0, and you’re set. So, for 6 months, pick the 6 months you want to count, set the others’ targets to 0, and everything will adjust accordingly. Thanks very much Svenja. That works for the word totals. Is there no way to adjust the countdown in the ‘Days Left’ column to count down six months as opposed to 12? Hi again – it should all be fixed now, so if you re-download, it should adjust the “Days Left” box properly. Hey. Happy New Year to you and thanks for the amazing trackers I’ve been using for years. Do you think you could make a Thorin design? I like Kili, but I love Thorin (and Bard, but that’s pushing it, lol). Thanks. Hi! Happy New Year to you too. I can indeed make a Thorin design, yep! I’ll try to get it done today. I don’t have any Bard art I can use alas, but Thorin should be no problem! Thank you! That would be amazing! Thanks. It’s up now! Here’s a link: https://gum.co/PcXUD Let me know if there’s any problem! THANK YOU! I downloaded and donated (the name is different). Just so you know, the link higher at the page, leads to Kili tracker. And thanks again. Thank you so much for the support, and for pointing out the link issue – I’ve fixed it now :) Cheers! Is there going to be a Beauty and the Beast version this year? Gumroad says it’s not currently on sale. No problem. Glad I asked. There are so many options to choose from but that was my favorite. Thank you for the quick response and the beautiful art. I downloaded this at the beginning of the month after using it at the end of last year, and I was/am super excited to use it for the entirety of 2018. I thought someone else would point out this issue, but I have not seen anything posted here and have re-downloaded a few times just in case you updated the files (to no avail). Both in the downloaded spreadsheets and your preview shots, the Yearly Word Tracker’s “Date” column shows 2017 instead of 2018. This is true in not only January, but in every other month, as well. Now this wouldn’t be such an issue if I knew how to change it myself, but I’m absolutely useless in Excel, so I’m posting here in hopes that I might be able to procure a fixed version. That’s odd – I just looked, and they show 2018 for me. (I’m using last year’s preview shots, because nothing really changed and I was lazy, that’s why those say 2017.) Which design are you using? Maybe I missed one. If you want to email it to me, I can fix it for you and send it back. You should be able to just reply to the confirmation email you got from Gumroad, and reach me that way :) You can also try fixing it yourself, if you go to the January sheet, select the very first date cell (C11) and just change it to say 1/1/2018. But yeah, if you could please let me know which design you’re using so I can fix it and upload the corrected version, that’d be great. Thanks! Hello! Thank you for your quick response. I did not realize it was such an easy fix. Sorry to have made a such a long comment about a trivial issue that can be fixed in one click. The design I am using is the default one, but I looked again, and you’re right. It is correct. I’m not sure exactly what happened, now. Maybe I changed it on my own somehow (as I said, I’m horrible at Excel and wouldn’t put it past me, haha). P.S. 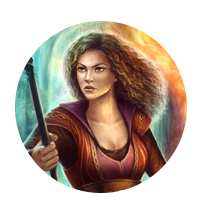 I understand why you would use last year’s pictures; I wasn’t sure if it was intentional or not. Can your spreadsheets be used for tracking multiple projects? I’m currently outlining two new novels and then revising my first. Thank you!